WinAutomation will keep an eye on your system or your emails and start working for you if any change or event is detected! WinAutomation allows you to execute any of your Processes automatically based on your chosen triggering event thanks to System Monitoring. Just set up your tasks to run exactly when you need them, by selecting any of the different options in the Triggers event menu. 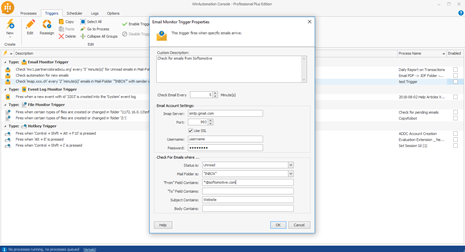 There is a host of available Triggers to choose from, ranging from File Monitor Trigger, Ping Server Trigger, Keyboard Trigger, Event Log Trigger and many more. WinAutomation will monitor your targeted folders for any operation of file creation, deleting, changing, renaming. As soon as a change is detected it will trigger your specified Processes. 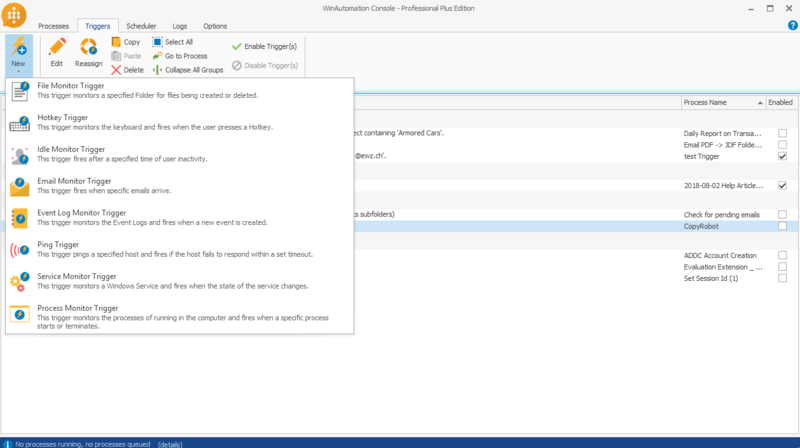 WinAutomation will also keep an eye out on the Event Log, so if you are a system administrator that wants to know every time things go wrong, WinAutomation can send you a warning e-mail, or remedy the situation, or escalate it for decision making and acting upon it… you name it! WinAutomation will monitor your workstation’s Windows Services running in the background. When a Service starts, or pauses or stops you can have a Process respond to that. Keep yourself informed about any Windows Service change and take actions whenever a critical windows service is not up and running. WinAutomation will also keep an eye out on your running Windows processes and respond accordingly with the respective Automation, when a process starts or terminates. Select any key combination to be the match that will light up your Process execution, when pressed by the user. Assign common and easy hotkeys to Processes that you use several times within your everyday work routine and boost your productivity while minimizing your effort and workload. Use email monitor Trigger to monitor your email account for incoming e-mails which meet criteria that you have defined. As soon as an e-mail arrives and it meets these criteria, a Process starts executing. More often than not there are cases were information from the Trigger that started the Process is needed within the execution of a Process. For example, you may need the file name that was created and eventually fired the execution of a process with a “File Monitor Trigger” attached to it. Don’t worry, we got you covered. 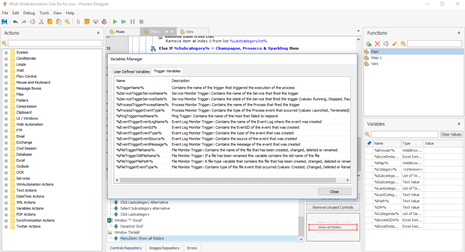 WinAutomation has built-in variables that hold information about Triggers like %TriggerName%, %FileTriggerFileName% and so on!